Experts recommend that adults get at least 150 minutes of moderate aerobic activity or 75 minutes of vigorous aerobic activity per week, but does it matter what time of day the physical activity is taking place? Studies show advantages for both morning exercise and afternoon/evening exercise. While there are different advantages with both times, there is one common objective: getting the adequate amount of exercise, whether it is in the morning or evening. The main advantage of morning workouts is the effect it has on your sleep. A study of those who worked out at 7am, 1pm, and 7pm showed that those who worked out at 7am had not only a longer, but deeper sleep. Good sleep can also help with weight loss by controlling the hormones that control your appetite. It has been shown that morning workouts are easier to keep consistent than afternoon workouts because things tend to come up throughout the day that get in the way of your gym time. The advantages of afternoon workouts have to do with your body’s core temperature. Working out with a cold body can leave you feeling stiff and more prone to injury, whereas warmer body temperatures increase flexibility. Your body temperature rises throughout the day and is at its highest in the afternoon. Strength, endurance, and reaction time all peak in the afternoon, while heart rate and blood pressure are at their lowest. All of these factors work together to improve your performance. Another advantage of afternoon workouts are your hormones, specifically testosterone. Testosterone is important for muscle growth and strength. It just so happens that the body produces more during those late afternoon workouts than during morning workouts. But, as previously stated, the most important thing is to get your recommended amount of exercise. 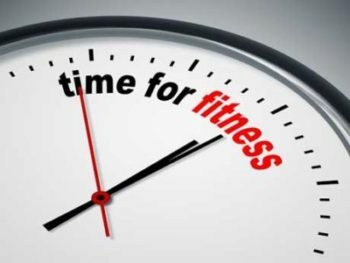 That means that the best time to exercise is when it is the best time for you! When is the time that you are most likely to stay consistent? Think about factors such as location, time of day, type of physical activity, and social setting. For example, if you are not a morning person and dread waking up early every morning, early morning workouts probably won’t be very consistent for you. Going to a gym that is dark, dreary, and not so motivating can also affect consistency. Some people prefer working out alone, while others might need that push and motivation from friends. Everyone is different, so it is important to find out what works the best for YOU and stay CONSISTENT!